Reduc acoustic flooring has a long history and unlike many of its competitor’s it was not bought to market simply to capitalize on the 2003 amendment to Approved Document E of the building regulations. Instead it has been developed as part of a continuing programme of research, development and innovation to provide Optimum acoustic performance beyond set standards. Reduc acoustic flooring has been tested to demonstrate compliance with current Legislation by rigorous site based testing as opposed to sterile laboratory based testing. In 2003 new Building Regulations were introduced under 16 different headings to ensure that a set standard of criteria was adhered to when undertaking any building or construction work. Approved Document E is a government released document that sets out the requirements for ensuring that the ‘resistance to the passage of sound’ is met. This document outlines in detail what is required to be undertaken to ensure that residents and users within dwellings are protected from noise pollution from either internal or external sources in England & Wales. Different requirements for Scotland and Northern Ireland are required to be met. AIRBORNE noise is an wanted sound that is transmitted through the air from sources such as (but not limited to) speech, television, radio, animal sounds, transport etc. IMPACT noise is an unwanted form of structure borne sound that occurs when an object impacts on another resulting in the generation and transmission of sound. In buildings this is normally foot fall, items being dropped etc. FLANKING TRANSMISSION – Reduc flooring is not tested for nor does it control flanking sound as this is transmitted between spaces indirectly by going over or around the construction as opposed to through it. Further advice can be given on dealing with flanking transmission when using Reduc as required. 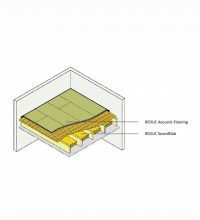 What is REDUC® acoustic flooring? A multi-layered board consisting of 2 different mass layers separated by beads of a visco-elastic damping compound. A felt resilient layer to the rear of the panel allows the floor board to be de-coupled from the sub floor or joists. A single mass layer board with a felt resilient layer to the rear of the panel which allows the floor board to be de-coupled from the sub floor or joists. A heavy rubber mass layer with a felt resilient layer to the rear of the panel which allows the floor board to be de-coupled from the sub floor or joists. REDUC® acoustic flooring can be used as an overlay board to an existing timber deck, on concrete floors as an overlay or as part of a cradle and batten system or as a structural board laid direct to joists, so no matter what the application REDUC® has a solution to suit. REDUC® acoustic flooring accepts most conventional floor coverings, can be used with underfloor heating, in wet room applications and even non-load bearing partitions can be built direct on to REDUC® Foundation 35 and Foundation 39 floor boards. REDUC® is also simple to install given that the boards are only required to be bonded with no mechanical fixings required. To assist in identifying suitable products for your project the table below will assist in identifying the type of application and floor finishes that can be used with our acoustic flooring products. Once a suitable acoustic floor board has been identified further detailed information can be found on our product data sheets available on our website. As well as a comprehensive acoustic flooring range, H&H Acoustic Technologies Ltd can supply a range of materials to assist in reverberation control and sound reduction issues. We also are able to provide full support and acoustic testing through our fully qualified acoustic consultant. 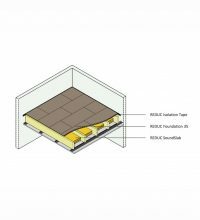 Description: The REDUC® FireFloor system comprises two components, FireMesh and FireWool. Its primary purpose is to upgrade an existing 30 minute fire rated ceiling i.e. lath and plaster or a single 12.5mm plasterboard layer to 60 minutes. FireFloor provides the perfect solution when access to the ceiling below is not available. 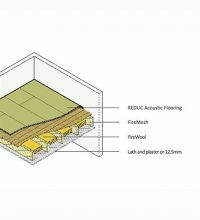 Description: REDUC® Strata Extra is an acoustic overlay flooring product suitable for use on new and existing timber floors. It comprises an upper layer of moisture-resistant MDF isolated from a layer of dense cement particle board by visco-elastic sound damping strips. The underside incorporates a resilient layer of acoustic felt, which provides mechanical isolation from the existing floor structure. REDUC® Strata Extra is 35mm thick and is designed to damp vibration and attenuate both airborne sound and impact noise passing through floors. 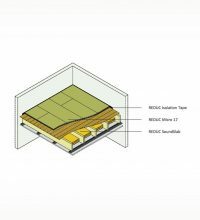 Description: REDUC® SoundMat is an extremely effective, easy to fit, acoustic underlay manufactured from a high density polymeric barrier, bonded to a resilient layer of acoustic felt. 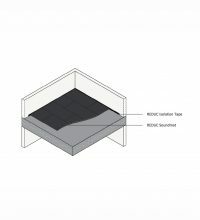 Description: REDUC® SoundSlab is a non-combustible, moisture resistant, acoustic slab with a high performance binder. It is designed to improve the acoustic performance of separating floors, ceilings and partition walls by reducing sound transmission through the structure. SoundSlab is used as an integral component in the REDUC® acoustic flooring systems. Description: SoundFloor® 32 is a structural and overlay acoustic flooring product suitable for use on new and existing timber and concrete floors. It can also be fitted as part of a cradle and batten system on concrete floors where there is a requirement for a service void. It comprises an upper face of moisture-resistant, tongue and grooved chipboard with an acoustic felt on the underside to provide mechanical isolation from the existing floor structure. REDUC SoundFloor® 32 is 32mm thick and is designed to damp vibration and attenuate airborne sound and impact noise passing through floors. Description: SoundFloor® 28 is a structural and overlay acoustic flooring product suitable for use on new and existing timber and concrete floors. It can also be fitted as part of a cradle and batten system on concrete floors where there is a requirement for a service void. It comprises an upper face of moisture-resistant, tongue and grooved chipboard with an acoustic felt on the underside to provide mechanical isolation from the existing floor structure. REDUC SoundFloor® 28 is 28mm thick and is designed to damp vibration and attenuate airborne sound and impact noise passing through floors. Description: REDUC® Foundation 39 is a structural and overlay acoustic flooring product suitable for use on new and existing timber floors. It comprises two layers of moisture-resistant chipboard, separated by visco-elastic sound damping strips. The underside incorporates a resilient layer of acoustic felt which provides mechanical isolation from the existing floor structure. REDUC® Foundation 39 is 39mm thick. It is designed to damp vibration and attenuate airborne and impact noise passing through floors with the ability of providing a structural base. Description: REDUC® Foundation 35 is a structural and overlay acoustic flooring product suitable for use on new and existing timber floors. It comprises two layers of moisture-resistant chipboard, separated by visco-elastic sound damping strips. The underside incorporates a resilient layer of acoustic felt which provides mechanical isolation from the existing floor structure. REDUC® Foundation 35 is 35mm thick. It is designed to damp vibration and attenuate airborne and impact noise passing through floors with the ability of providing a structural base. 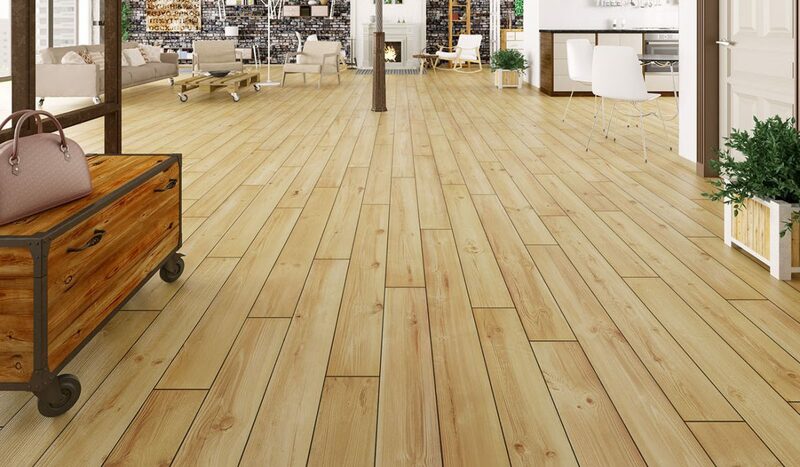 Description: REDUC® Micro 21 is an overlay acoustic flooring product suitable for use on new and existing timber floors. The substrate layers of moisture-resistant MDF and cement particle board are separated by visco-elastic sound damping strips. The underside incorporates a resilient layer of acoustic felt which provides mechanical isolation from the existing floor structure. REDUC®Micro 21 is 21mm thick and is designed to damp vibration and attenuate both airborne sound and impact noise passing through floors whilst having minimal impact upon room height. Description: REDUC® Micro 17 is an overlay flooring product suitable for use on new and existing timber and concrete floors. 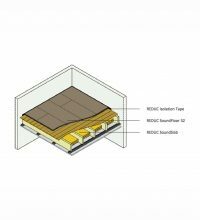 The substrate layers of moisture-resistant MDF and fibreboard are separated by visco-elastic sound damping strips. The underside incorporates a resilient layer of acoustic felt which provides mechanical isolation from the existing floor structure. REDUC® Micro 17 is 17mm thick and is designed to damp vibration and attenuate both airborne sound and impact noise passing through floors whilst having minimal impact upon room height.